Signature burger: I don't know if we have a signature burger. They all sell pretty well. People seem to flock to the Burger of the Week. 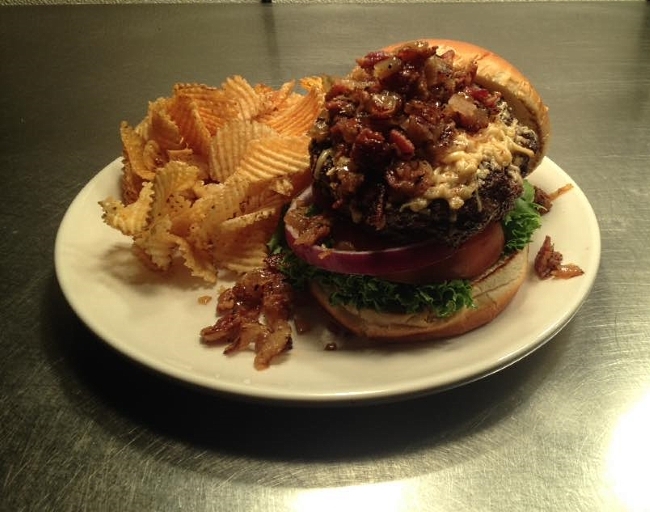 This week is the Smoked Gouda Bacon Burger made with our homemade bacon jam. Last week was the Down South Burger which had fried green tomatoes, pimento cheese, and chow chow. How they wound up here: Won the Ketchup Region by receiving 58.4% of the vote in the Round I match-up against Melvin's Hamburgers & Hotdogs, 55.7% of the vote in the Round II match-up against The Fork N Cork, 61.6% of the vote in the Round III match-up against Brooks' Sandwich House, and 53.9% of the Round IV vote against Big Burger Spot. 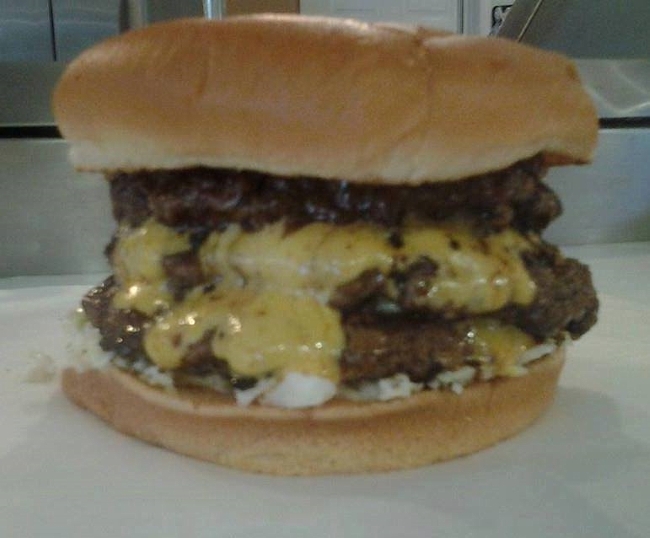 Signature burger: We are known for our delicious cheese stuffed burgers! All Juicy Lucys are stuffed with White American Cheese. 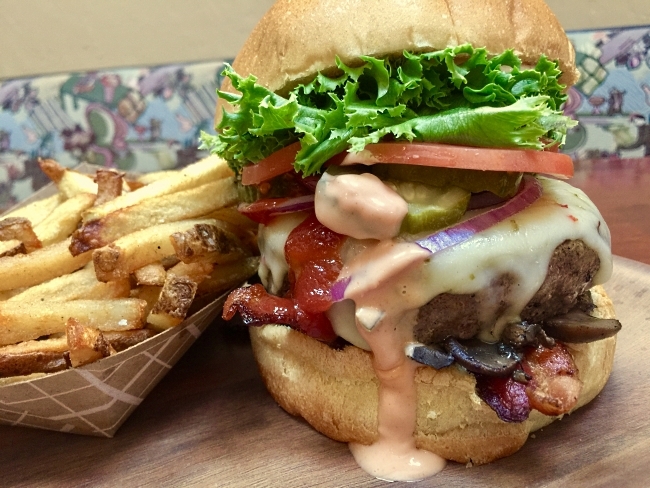 The burger in our photo is our Award-winning Cowboy Bacon Juicy Lucy which is topped with White American cheese, our Cowboy rub, 2 slices of applewood smoked bacon, our house made Lucy Gone Wild Sauce (made with fresh habanero), and Bourbon BBQ. How they wound up here: Won the Cheese Region by receiving 64.0% of the vote in the Round I match-up against Tony's Ice Cream, 63.9% of the vote in the Round II match-up against Emma Key's, 67.3% of the vote in the Round III match-up against Bang Bang Burgers, and 52.8% of the vote in the Round IV match-up against P.T. 's Old Fashioned Grille. 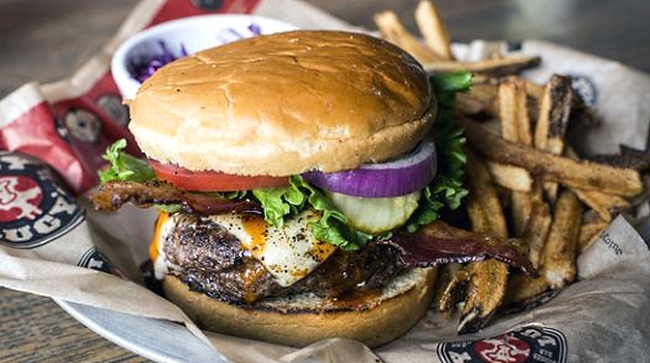 Signature burger: Our signature burger is our Build Your Own Burger! Customers can choose from five different breads; seven different cheeses; the following toppings: jalapeño cream cheese, PorterHouse blackberry jam, peanut butter, roasted red pepper, grilled mushrooms, grilled onions, grilled green peppers, creamy coleslaw, pico de gallo, sliced avocado, grilled pineapple, roasted poblano peppers, fried egg, PorterHouse chili, PorterHouse pimento cheese, goat cheese, fried pickle chips, onion rings, guacamole, Neese's bacon, candied bacon, PorterHouse mac & cheese, grilled shrimp, pulled pork, and prime rib; and ten different sauces. How they wound up here: Won the Pickle Region by receiving 56.1% of the vote in the Round I match-up against Moo & Brew, 56.2% of the vote in the Round II match-up against Smashburger, 56.8% of the vote in the Round III match-up against Hops Burger Bar, and 50.7% of the vote in the Round IV match-up against Riverwatch Grill. Date business opened: We've been open now for about three years. Signature burger: The Carolina Triple Threat is our signature burger and it consist of 3 custom ground fresh daily 1/3 pound patties with our made from scratch chili and fresh made slaw from family recipe, thick American cheese on a buttered and toasted bun. Remember that time you made the most amazing burgers you've ever tasted at home and said if I sold these we'd make a fortune? That's what we did. Everything is made to order using the highest quality ingredients. Nobody does what we do. How they wound up here: Won the Onion Region by receiving 62.5% of the vote in the Round I match-up against The Burger Shop Of Wake Forest, 53.9% of the vote in the Round II match-up against Cowbell Burger & Whiskey Bar, 56.5% of the vote in the Round III match-up against The Old Sharkey's Grill, and 50.9% of the vote in the Round IV match-up against Ray's Smokehouse.